The City is amending its development code to facilitate the implementation of the Town Center VISION that was created earlier in 2018. Comment on the elements of the environment, as well as potential alternatives, concerns about potential impacts, and possible mitigation measures to be analyzed in the environmental impact statement (EIS). The EIS will look at potential changes to the City’s Planning and Land Use Regulations and related redevelopment scenarios. Learn about other ways to comment. 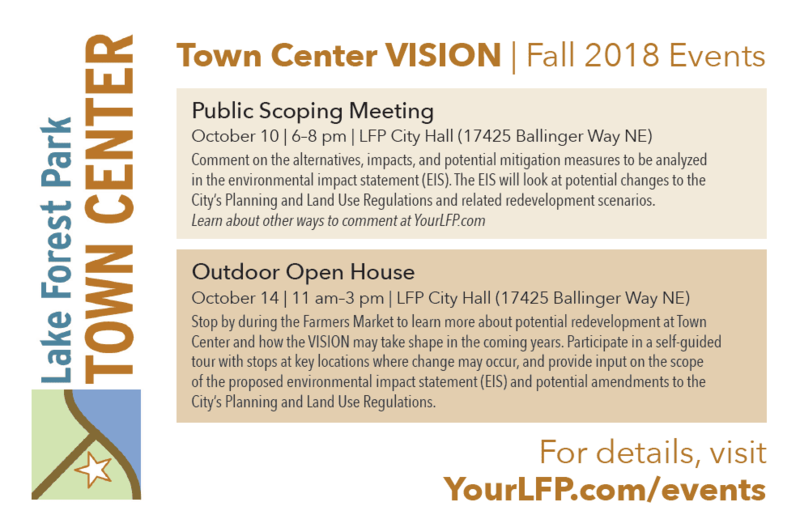 Stop by during the Farmers Market to learn more about potential redevelopment at Town Center and how the VISION may take shape in the coming years. Participate in a self-guided tour with stops at key locations where change may occur and provide input on the scope of the proposed environmental impact statement (EIS) and potential amendments to the City’s Planning and Land Use Regulations.